In honor of National Financial Literacy Awareness Month, our friend Shannon from The Heavy Purse has put together a celebration of sorts. Part of that celebration is to host a carnival of NFLAM posts in order to help awaken the public to the importance of financial literacy by sharing important info and stories from those on the road to financial freedom. Go here to get the scoop and get links to all of the posts for this informative and education carnival. I suppose our story of how we made such a mess of our finances starts when we were children. My husband and I both came from broken homes. Money was a problem for our parents, both before and after their divorces. Poor money management on the part of one or both of our parents’ caused financial despair during the marriages, and having even less money for our mothers to manage after the divorces caused more financial troubles. For my family personally, I can say that we were “dirt poor”. In the years following the divorce, my mom worked to raise 3 kids on the $300 a month child support that the judge deemed reasonable, which my dad faithfully paid every month. The house payment was $250, so that left $50 each month to cover food, utilities, clothing and the works. We went on welfare as my mom learned to drive a car and teach herself to type so that she could eventually qualify for a job. Eventually, she landed work and things lightened up a bit, but those days of dirt poor were ingrained in my memory. The days of being teased at school for my $2 canvas tennis shoes and thrift store jeans were burned deep within my soul, and at some point during my teen years, I vowed that I would never again be looked down upon for not having what others enjoyed so casually, as if it were the norm to have Nike tennis shoes and Jordache jeans. When I first started working at 15, I spent every single dime on clothing. At 16, I got my first department store credit card, and so the cycle began. I saw my credit card as a way to boost my goals of being one of the Joneses. What would follow was a 25-year journey to keep up, or surpass, those around me. Never again would I hear “No. We can’t afford it”. Little did I know or understand at that point, but my need to have things was really about a whole lot more than not having enough money. My husband went the opposite route with his money lessons from childhood; he hoarded like crazy. When I met Rick he was 25, living at home, had just moved from a $6 an hour job to a $12 an hour job and had over $20,000 in the bank. Soon afterward, he took $6,000 out for a down payment on a new truck. We married less than a year later, and as Rick’s home life with an abusive father left him fearful of confrontation, he didn’t argue when I said I wanted to manage the family finances. After all, I reasoned, I work in banking. I know what to do. I did know what to do. The problem was that my pursuit to “have it all” trumped my knowledge and common sense when it came to managing our money. I was using money and all that it bought to fill old voids and heal old hurts. Slowly – very slowly – I was learning that those hurts needed to be healed from the inside out, but since I still wasn’t budgeting or tracking our spending, things were still a mess for us financially. After my layoff in 2003, we decided I would stay home with the kids, leaving us with even less money to manage poorly. Our one-income went away when Rick was laid off in the beginning of 2010, but it still wasn’t enough to keep me from thinking I could buy my way to happiness. If the money went in, I found a place for it to go out. Fear of not having enough stuff battled in my mind with fear of having debt, and we went through cycle after cycle of paying off the cards and charging them up again. In October of 2012, after we traded in our suburbia mini-mansion for a small hobby farm and charged a $4,600 snow plow that we “needed” for the long driveway, something finally – FINALLY – clicked. We knew that we were in WAY too deep. Our debt to income ratio (monthly debt payments divided by gross monthly income) was hovering around 65%. For those not in the know, mortgage companies generally only allow a 45% maximum debt to income ratio when approving someone for a mortgage loan. On January 1st of this year, we made a commitment, for the sake of our marriage and our children that we were going to get out of debt. Given our financial situation, we knew that this journey wouldn’t be easy, but we also knew that the ramifications of not getting our finances in order could not only devastate our children, but could destroy our marriage as well. We also knew that as a family, we deserved a better life than to just slave away to pay debts forever. We’re only 3.5 months into our journey to debt free at this point, but I can honestly say that our life has changed dramatically. By cutting expenses down to the bare bones, we’ve paid down over $2,400 on our total debt, our debt-to-income ratio is down to 61%, and we now have $2,000 in savings as an emergency fund. 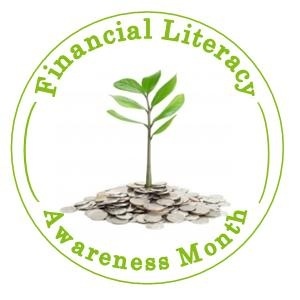 We ‘heart’ National Financial Literacy Awareness Month because it’s so very important to us that people no longer suffer from financial problems, most of which are so easily avoided in the first place with proper education and training. Things are slow going for us right now, but we’re focusing on the fact that they’re headed in the right direction. I would say, however, that the most important victory we’ve achieved is that because we’ve put a budget and a list of goals in place, we now have peace in our lives. No longer do we worry day and night about whether or not we’ll have enough to pay the bills, because we know that we are committed as a couple to do whatever it takes to get our debt paid off and to walk in financial literacy from now on. And there’s no “thing” on earth that can buy that kind of happiness. Finance always seems slow in the beginning. Just keep at it and eventually you’ll see your progress speed up and you’ll really start feeling great. Thank you for sharing Laurie, it is impressive how in your early years money can mark you and define how you will treat it as an adult. I am glad your marriage survived all that journey, it must have been hard but you are surely on the right path now! I agree with what MFIJ said. It starts off slow, but money has a way of multiplying. As you pay off high-interest debt it just speeds up. Thanks for sharing your tale Laurie. You really have inspired with your story here and the guest post you wrote for The Frugal Path. I really wish you the kids and Rick the best with your path. Thanks, so much, Justin. We’re so eager to inspire others in tough situations to get out of debt as well. People just don’t need to be slaves to their money any longer! I think what you`re doing is amazing, because it takes a lot of courage to cut down expenses the “great-depression”-way! It´s “funny” how things we experience in our childhood will have such big impacts on our adult lives. I´m looking forward to following your way to debt-freedom! 🙂 Go you!! Thanks so much, NG. I can’t wait to get there. BIG party!!! Thanks for sharing your story. it sounds a lot like my DH and I. Money and Security was important to me when I got older and grew up but I had a want for Nike and Levis’. My grandma could never afford them and neither could I.
I can remember those little brat kids that had both parents working and buying them fancy stuff saying, in order for you to be a prep you have to buy clothes that are 20 dollars a piece. Yeah, whatever. Little did they know, I had already found the thrift store and was wearing the same tags they were. but being like them really didn’t interest me. By the time I was 15, I was already out on my own and concentrated on school work and my job to pay my bills. I’ve never really cared about the Jones. My concern has always been that I made it even tho it was hard and many said I wouldn’t make it in the big bad world. Haha. Showed them. My hubby is my spender. His Dad had broken his back and couldn’t work. So, his mom was the worker. His dad was an alcoholic and money was always tight. Hubby can smell a cheap pair of Kmart shoes a mile away. We’ve been working on paying off our debt for almost 2 years and this year we are making huge strides. Last year was a little harder because hubby wasn’t exactly ready. This year…well, he is surpassing me in motivation and I’m proud. Thanks for sharing your story. For me, the company is what makes this journey easier and helps me with motivation when I’m just feeling a little burnt out. Great job making changes for a better life! That is amazing that your mom raised three kids on such a small monthly amount. I think you guys are taking some wonderful steps! Thanks so much, Holly. I really appreciate your encouragement. We’re working on it! I think it is great that you have seen the light and are making the necessary changes to improve your situation. It happens slowly at first, but before too long you will be right on top of that debt and wonder how you ever lived before. Thanks Glen. 🙂 I can’t wait for that day! What an inspiring story Laurie. I know many that have tried to fill the void with spending because it just feels good. Having new things to fill the wants is a great feeling, but it always ends poorly. I am glad to hear that you have made the change. The road ahead is going to be rocky, but you will be able to do it. I have faith in you and Rick and once you make that last payment, you will take on the challenge of growing your money. Good luck! Thanks for sharing your story! I’m happy you found the courage to turn things around. Everyone starts from different places, but it’s never too late to start. Seeing the progress you’ve made in that short amount of time, must feel great. Keep at it. Looking forward to your future posts. Well, Anthony, we figured the next years are going to pass whether or not we turn things around, so we might as well start now. :-). Now that we’ve started, we’re eager to keep moving toward our goals. Wow, simply wow. I’m really blown away by your story. Honestly, I think I’m more impressed by your commitment to your marriage and family than to get out of debt. It’s truly honorable you recognize how money can destroy a marriage and you’ve made a joint decision to dig yourselves out of debt. I’m really excited to follow your journey and ultimate success story. You know that sometimes when we are young we learn, live and see things that we don’t ever want to learn, live and see again. Many people go on to change their life and others stay on the same path they came from. The both of you came together for a reason and I’m sure that you will both stay together for a reason, because you love and care about each other more than anything in this world. You clearly are proving this with your journey today towards debt freedom. Let nothing stand in your way, share your voice as loud as you can. Cheers mate! Agreed! The simple act of taking back control of your money, rather than letting control you – definitely favors your ultimate success. I think your kids are fortunate to have role models like the two of you. Thanks so much for sharing your story. I know what it is like to be in banking and think you know what you are doing, that happened to me too. You will find, as you stay diligent in paying off your debt, that it will disappear faster than you planned. We originally had a 4 year payoff plan and actually got through our debt in 2 1/2 years. The key is just to remain consistent and keep your expenses low. Isn’t it funny how we use things to substitute for what we really need in our lives, which I believe is honesty. Instead of facing the issues from your past, you tried to fill up what was missing. While my motivation was a bit different, I tried to do the same thing by filling a void with stuff. The more you buy, the bigger the hole you are trying to fill becomes. Being free of debt is really the only way to fill the void, I think. That and finally being honest with yourself. You may have a long road, but starting is the hardest part, and you’ve made tremendous strides. Congrats! Thanks so much, Kim. I’m still excited about how great it feels to have that piece of the puzzle (knowing why and how we got into debt) solved. It feels like there are no barriers now! Great share, Laurie, and a great story indeed. It’s important that we all share our stories and egg each other on. This personal finance stuff is tough!! Enjoying your journey! I am glad I found your site. Thanks so much, Deirdre. I’m so glad you enjoyed the post. Yes, I’m very amazed that the house of cards held up – that in and of itself was a miracle. I’m just glad we started getting our act together before it collapsed. Whew! When I started paying on my student loans and getting serious about my finances I thought it would take me about 5 years to pay them off, I ended up kicking it into overdrive and paying them off in about 3. Once you’re on the right track you’ll be amazed at how quick you can actually make it happen. Can’t wait for your, “we’re debt free” post! Really, KK? That is so inspiring for me to hear. It really helps to keep us moving toward the goal. Have a wonderful weekend, friend! This is a great story of how you learned about personal finances. Fortunately, my parents were great at teaching me how to handle finances, so I’ve been able to avoid many of the problems that plague many people every year. That being said, I’m still constantly learning and make mistakes just like everyone else. Good luck with the rest of your journey, I look forward to following along! Oh, Jake, I’m so jealous! :-). Seriously, though, the one thing I’m really grateful for is that we are now using our mistakes to help others. I know there are lots in situations similar to ours that are feeling pretty overwhelmed.